Read about a man who used his gifts and talents in life and death to changing the world. How will we change the world? Jesus calls us to serve and to give of ourselves in Matt. 25 – read his words here. 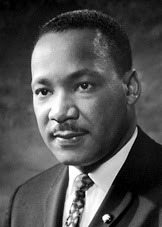 Read the Nobel Prize website bio of Martin Luther King Jr… click here (photo from the Nobel website). How are we living? how are we using our gifts and talents Jesus has given us to change the world? I am working on my laptop. The sun is blazing in the window. The sun shining on my laptop screen shows how dusty it is! So I wipe it off and I see more clearly. But in the other room with just artificial light, I don’t see the dust. We should seek the Son who shines the real Light on our hearts so that can see the dust and ask Him to wipe our soul clean through confession and His forgiveness. Arden has some important advice – about advice – over on her blog… click the link on the right to read her thoughtful words. von Lazo posted a short film (that Mark made) on a trip we took to Sarajevo last Feb. rather than post the film myself, I’ll send you to Laci’s blog to see it if you wish… click here. btw, its a snow day here in the ‘ville, here is Sweet Anna “the leftie” pummeling Becca in a snowball fight (note the snowball in the top right corner of the pic)!